I might have a slight avocado obsession. I put them in salads, in smoothies, on toast, and have even been known to smear mashed avocado on my hair as a mask. Whenever they go on sale, I go a little nuts. Luckily, avocados are a superfood, chock full of good fats and vitamins. They’re a perfect healthy alternative to cream, cheese, or mayonnaise, especially if you’re lactose intolerant. The creamy texture got me thinking that I could turn my avocado into salad dressing. I started by mashing up an avocado, adding in some apple cider vinegar, a little bit of mustard, and some olive oil. It turned into thinned guacamole-type dressing that I imagine would be good on just about anything. Since the dressing was so rich, I tossed it with some hearty raw kale. For some color and crunch, I added into beets, apples, and toasted pumpkin seeds. It’s a pretty fabulous salad, a little salty, sweet, and creamy. You might find yourself taking seconds or thirds, but why not when your salad is so good for you? The best part of all? It comes together in about 15 minutes and requires no special tools or skills. If you can make guacamole, you can make the avocado dressing. If you can chop vegetables, you can easily slice up the kale, beets, and apples. The salad is also easily adaptable, so feel free to substitute in carrots for beets, or walnuts for the pumpkin seeds. After all, nothing really tastes bad when smeared with avocado. Except maybe hair. Hillary Pollak is a junior at New York University, where she studies sustainable food and alternative health. Kale might be her favorite food. In a small bowl, mash the avocado until smooth. Stir in the vinegar, mustard, and olive oil. Add salt and pepper to taste. 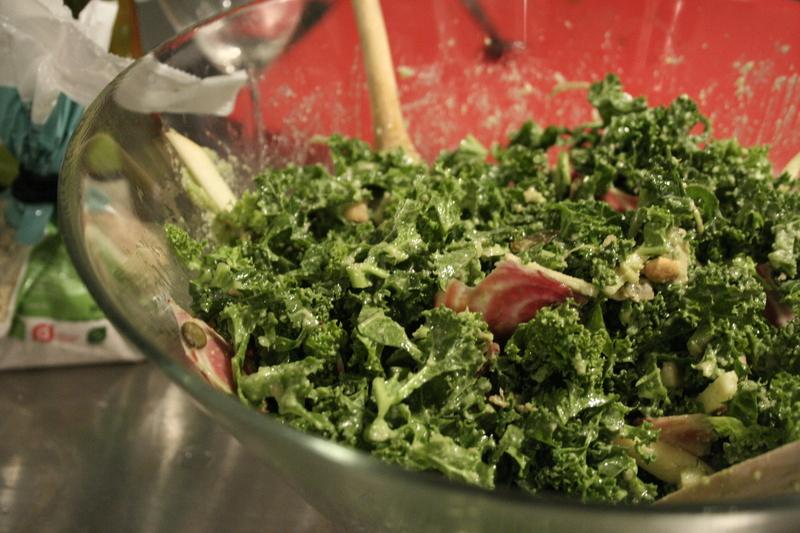 Place the sliced kale, beet, and apple in a large bowl. Pour in the avocado mixture and toss to combine. Top with the pumpkin seeds. Serve immediately.